How do you describe your work, Leah? My work is very freeform and has often been described as “organic”. I love pearls and flowing designs that have a natural looking assymetry. 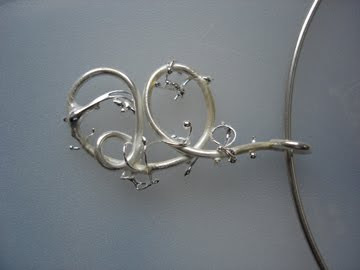 I would say my signature style is freeform pendants made from silver and pearls, but I also like to experiment with different materials and techniques. 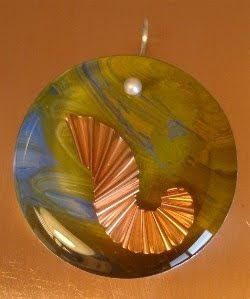 Besides pearls, I use a variety of semiprecious stones in my work, and I have a line of resin pendants with found objects embedded in them, as well as a line of picture pendants that incorporate images from my husband, Chris Ybarra’s, acrylic paintings. I chose Michon as my business name because it’s my middle name, and I’ve always liked it. I think I had named my business before I was even sure I wanted to have a jewelry business. Most of the time, my creative process starts with the materials. 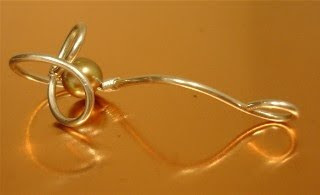 I’ll take a piece of silver and form it, then find the perfect pearl or stone to complement the shape. Sometimes it’s the other way around – I’ll have some beads out on my table and come up with a nice metal shape to show off the beads. I’ve collected beads, rocks, and shells as long as I can remember, and I love just looking at them and arranging them in different ways. When I’m in a very creative mood, I can work for hours without really thinking about anything else, so I try to take advantage of those times. If I’m feeling less creative, I’ll work on production – making some of my simpler designs, or a bunch of earwires or head pins. I try to work a little bit every day, even if I’m not feeling creative, because sometimes the act of getting out some materials will jumpstart my creativity. I do sketch sometimes, usually if I’m away from my materials and I get an idea that I think is good. I carry a small notebook in my purse so that I can jot down ideas whenever they come to me. I also have one by my bed for brainstorming before going to sleep or first thing in the morning. I take jewelry making classes occasionally – I started with beading classes as a teenager, then took a basic wire class, and since then I’ve taken basic metalsmithing and some mixed media jewelry classes. Classes are very useful for learning techniques, and I especially recommend them for anyone who wants to start using torches, chemicals, and power tools. It’s good to learn proper safety measures from a pro. I haven’t taken any design classes – design is something that I learned gradually from experimenting on my own. Most classes that I find focus on a project and the techniques needed to complete that project. I like to take what I’ve learned from a class and then see what I can come up with to use the technique in a different way. I have no formal business training, so I’ve learned the hard way about how to run a business and make it profitable. After starting my business, and not making any money at first, I bought a couple of marketing and business books and read all I could online about being a successful entrepreneur. Running a business is a lot of work, much more than I expected when I got started. Today, my business is part time but profitable. I’ve learned through experience how to price my work, places to sell it, how to network locally and do local shows, and how to spend my money so that I’m not wasting all my profits on supplies or tools that I won’t use. Pearls. I don’t know of anything more beautiful, to me anyway, than pearls. 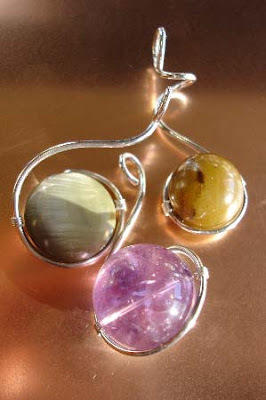 If I didn’t know how to make jewelry, I’d probably carry them around in my pockets to look at. The ocean, the desert, trees, creative people, art, architecture, vines, shapes, color, texture, my husband, rivers, pretty shiny things, fire, rivers….inspiration is everywhere. 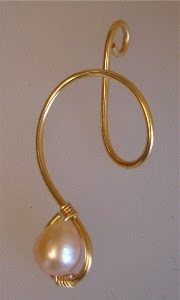 A few jewelers who inspired me when I first started making jewelry are Michael Good and Arline Fisch. Michael good does these gorgeous flowing designs using anticlastic raising techniques. Arline Fisch uses textile techniques with metal sheet and wire, and makes really wild jewelry with those technqiues. Now that I’ve been making jewelry for a few years, I’ve discovered many other amazingly talented jewelry designers, but those two were the first that really made me want to make jewelry. I think I’m one of those people who likes a challenge. I have my share of motivation problems and frustrations, but then I think “so-and-so did this, I can do it too.” And I mentally yell at myself to get over it and quit being so lazy, which usually works. I’m definitely better at motivating myself to do the creative work than the business aspects of it though! Do something creative every day. Even if you only have a few minutes, write in a journal about things you’d like to create, or sketch something. My day job, sleep, and my marriage/social life. Luckily I’m married to an artist, so we spend a lot of time in the studio together. Cheese, or chocolate. My comfort hobby is knitting/crocheting. Knit and crochet projects take so much time, and are very repetitive/meditative, which helps me slow down.